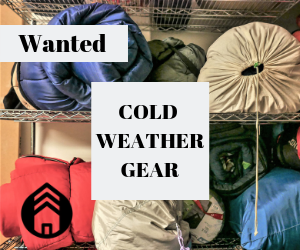 You are here: Home / Blog / Blog / Wanted: Cold Weather Gear! Contrary to popular assumptions, hypothermia, and many other cold weather-related issues can set in when temperatures get below 50͒ F. Meaning that the temperature doesn’t necessarily need to drop below freezing to cause severe and lasting damage. This is only one reason why individuals experiencing homelessness have a significantly higher risk than the housed population of developing conditions related to cold weather exposure. To donate any of these items, or to learn more, you can visit our full list of needs, here. JOIN works each day to help transition individuals experiencing homelessness to permanent housing. But unfortunately, not everyone is able to sleep somewhere warm during the winter months, and exposure-related conditions can be unavoidable. Cities typically offer ‘cold-weather shelters’ to temporarily house individuals during winter. But, due to low budgets or other restrictions, many of these shelters are only open at night, or only open when the temperature passes below a cut-off point. Because of the inconsistency, there are still many vulnerable individuals suffering in the cold throughout the winter. If you’d like to support JOIN in our efforts to meet the unique needs of all we serve throughout the winter months, please consider donating, here.